Achilles tendinitis causes inflammation and degeneration of the achilles tendon. The achilles tendon is the large tendon located in the back of the leg that inserts into the heel. The pain caused by achilles tendinitis can develop gradually without a history of trauma. The pain can be a shooting pain, burning pain, or even an extremely piercing pain. Achilles tendinitis should not be left untreated due to the danger that the tendon can become weak and ruptured. Achilles tendinitis is aggravated by activities that repeatedly stress the tendon, causing inflammation. In some cases even prolonged periods of standing can cause symptoms. It is a common problem often experienced by athletes, particularly distance runners. Achilles tendinitis is a difficult injury to treat in athletes due to their high level of activity and reluctance to stop or slow down their training. Individuals who suffer from achilles tendinitis often complain that their first steps out of bed in the morning are extremely painful. Another common complaint is pain after steps are taken after long periods of sitting. This pain often lessens with activity. 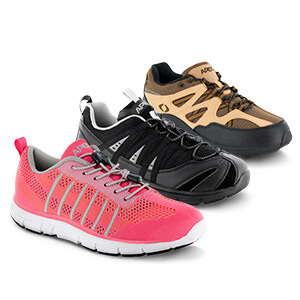 Apex’s health-conscious footwear provides Achilles Tendinitis relief using cutting-edge technology and design, making this selection of shoes ideal for walking, running or casual wear. Because Achilles tendinitis is often caused by over-pronation, Apex shoes are constructed specifically to control pronation and reduce tendon strain. In addition, superior heel control and arch support further limits strain on the Achilles tendon. Each shoe includes contoured inserts that may be removed to accommodate prefabricated or custom inserts to achieve the perfect fit. For additional relief from heel pain, Apex has developed the most innovative suite of prefabricated orthotics available anywhere. There are several factors that can cause achilles tendinitis. The most common cause is over-pronation. Over-pronation occurs in the walking process, when the arch collapses upon weight bearing, adding stress on the achilles tendon. Other factors that lead to achilles tendinitis are improper shoe selection, inadequate stretching prior to engaging in athletics, a short achilles tendon, direct trauma (injury) to the tendon, and heel bone deformity. Athletes, particularly runners, should incorporate a thorough stretching program to properly warm-up the muscles. They should decrease the distance of their walk or run, apply ice after the activity and avoid any uphill climbs. Athletes should use an orthotic device, heel cup, or heel cradle for extra support. A heel cup or heel cradle elevates the heel to reduce stress and pressure on the achilles tendon. The device should be made with light-weight, shock absorbing materials. An orthotic device can be used to control over-pronation, support the longitudinal arch, and reduce stress on the achilles tendon. Apex therapeutic footwear provides Achilles tendinitis relief using cutting-edge technology and design, making these ideal shoes for walking, running or casual wear. Because Achilles tendinitis is often caused by over-pronation, Apex shoes are constructed specifically to control pronation and reduce tendon strain. In addition, superior heel control and arch support further limits strain on the Achilles tendon. Each shoe includes removable contoured inserts that may be removed to accommodate prefabricated or custom inserts to achieve the perfect fit. For additional relief from tendon pain, consider purchasing a prefabricated insert from Apex’s suite of prefabricated orthotics.